Now that the Florida Clemency Board has granted Jim Morrison a posthumous pardon for exposing himself during a 1969 concert, it seems appropriate to revisit another rock star arrest from that year. The transcript of Hendrix’s testimony is an amusing account of drugs, touring, Bromo-Seltzer, and the time he enjoyed a hash cake while celebratintg his birthday in Ireland. To download a PDF of the 37-page Hendrix transcript, click here. 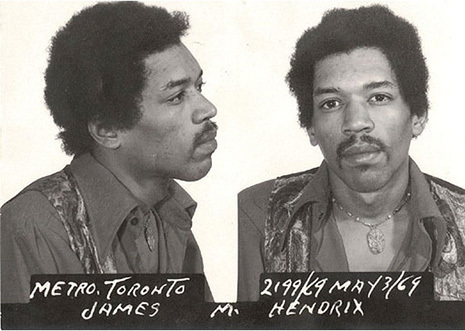 Hendrix, pictured in the above mug shot, was acquitted of the drug charges. He died of a drug overdose in September 1970. Tip For Wannabe Thelmas And Louises: Don’t Waste Your Time Googling "Tracking Device"
Submitted by Will T. on Mon, 2010-12-20 20:26.
just to correct something.. Hendrix was actually murdered by his manager Michael Jeffery. Submitted by KnumbKnuts on Fri, 2010-12-10 13:26.